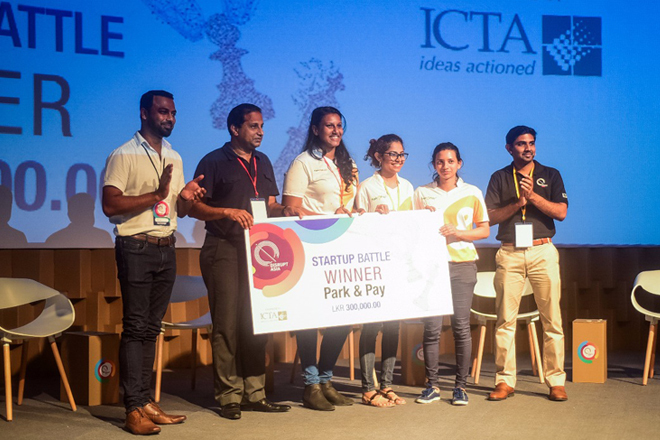 Park and Pay was crowned the winner of Start-up battle at Disrupt Asia 2018, Sri Lanka’s Premier Start-up Conference and Innovation Festival, which took place on August 11, 2018 at the Trace – Expert City. The event, with participation of experts from different fields, promoted the innovation ecosystem which is a key pillar of Science, Technology, Engineering, Arts and Mathematics (STEAM). The competition, in front of a jury of professionals, required participants to explain the concept, achievements, and growth plans behind their start-up ideas in interactive pitch sessions. Following a challenging cross-examination from the jury, Park and Pay was named the winner for their app-based innovative solution for motorists to find vacant parking spaces anywhere in Colombo, allowing seamless booking and payment within the app in only 3 clicks. The 4 start-up finalists that pitched their products to the jury were iLoan, Park and Pay, Sixer Video and uPay. While Park and Pay emerged as the winners, Sixer Video was placed second. The two teams received cash prizes and will be representing Sri Lanka at the Oslo Innovation Week 2018 which will take place between the 24th to 28th September. Disrupt Asia was organized by the Information and Communication Technology Agency of Sri Lanka (ICTA), and supported by the Ministry of Telecommunication, Digital Infrastructure and Foreign Employment, International Partner – IKT Norge, Knowledge Partner – PWC, Supporting Partners GIZ Sri Lanka and Trace – Expert City, Payments Partner – PayHere, Volunteer Partner – GudPpl, Eco System Partner – SLASSCOM, Makerspace Partner – Igniter Space, Social Innovation Partner UNDP Sri Lanka and Hosting Partner Calcey Technologies.